As I sat on the plane en route to Atlanta Georgia for the Aquatic Gardeners Association Convention, I attempted to imagine what it would be like to meet 100 or so planted aquarium enthusiasts just like myself. 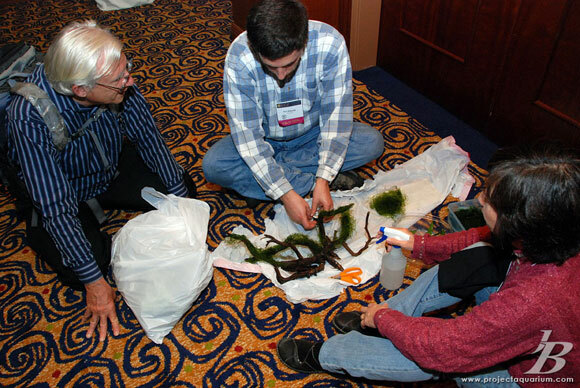 Prior to the AGA Convention I had met only a very small number of planted aquarium enthusiasts in person. 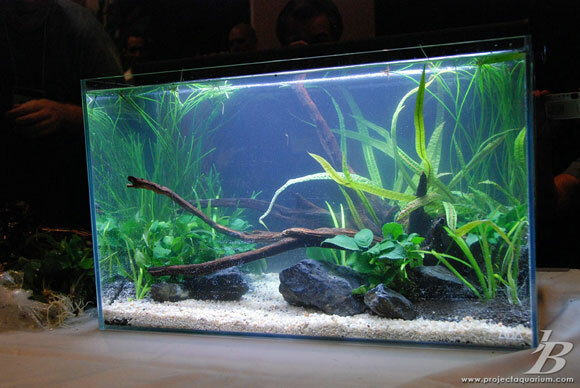 I had certainly talked with many through planted tank forums or email; however, it is always something different when you meet people in person. I was excited and apprehensive all in the same breath. 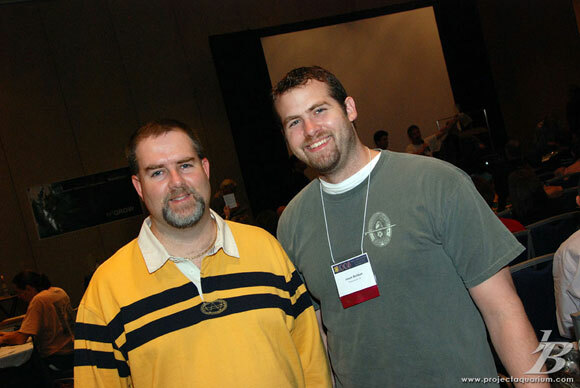 After meeting with my roommate John, we headed into the Sheraton Atlanta to check in. After a quick visit to our room to drop off our luggage we headed down to the hospitality suite to begin an adventure that would soon become one that I would never forget! 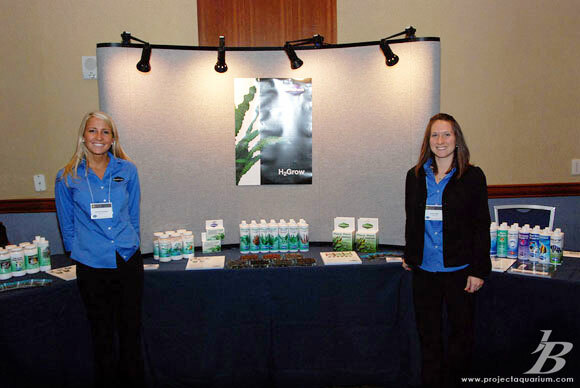 We made our way down to the hospitality suite to register and meet our new friends. I walked into the suite and was quickly greeted by Cheryl. She checked me in and gave me my nametag. Cheryl didn’t waste a second in telling me about what I should expect and what to look forward to. Her dedication to coordination was apparent and didn’t stop throughout the entire weekend. 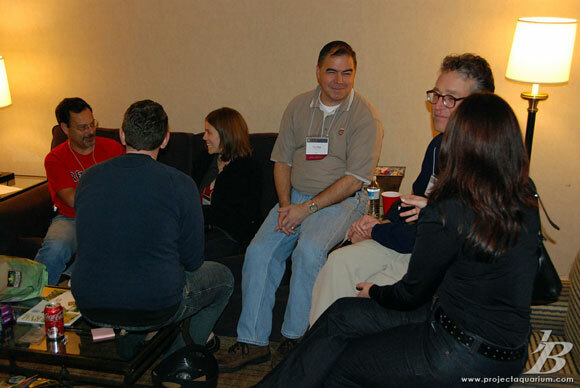 The suite buzzed with people catching up; discussing planted aquariums, and aquarium related topics. Snacks and drinks were provided as we all settled into getting to know each other. It really was great to begin the weekend with getting to know people, putting screenames with faces, and seeing old friends. 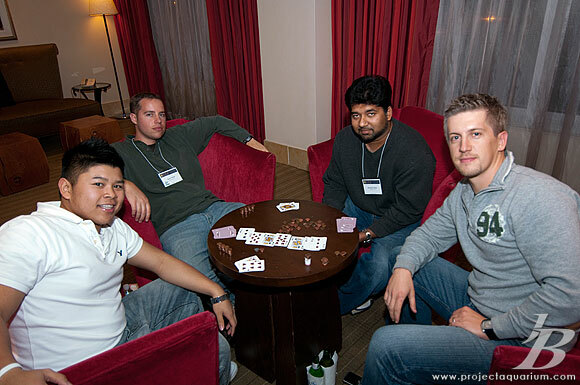 As people moved away from the suite to catch up on much needed sleep, Jay L., Aaron Talbot, John Dinh, Ghazanfar Ghori, and myself retired to the hotel lobby for a couple games of poker. Special thanks to Jay L.! After a $20 hotel breakfast, we all gathered in the lobby in preparation for the walk to the Georgia Aquarium. 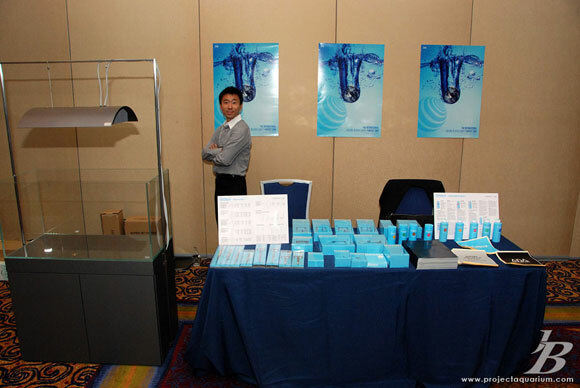 This was the first time I was to see planted aquarium guru, Mr. Takashi Amano. I was a little more star struck then I thought I might be, but I guess I should have expected that considering what he has done for our planted aquarium hobby. The walk to the Georgia Aquarium was short and pleasant; it gave us all time to stretch our legs and get to know each other a bit more. I am writing articles on both the Georgia Aquarium and Mr. Amano, the stories and pictures are just too vast to cover in this article. Check back soon for both of those. 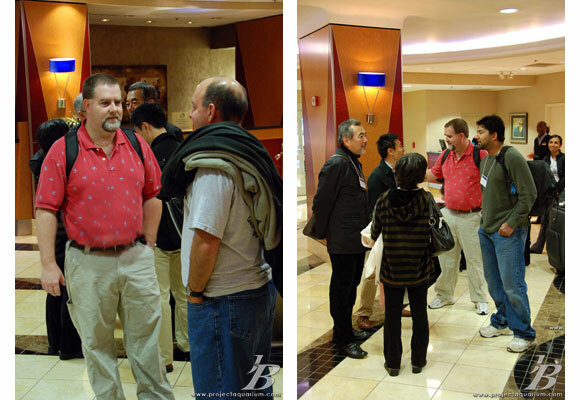 After returning to the hotel, the convention festivities officially began. Everyone filtered into the vendor/registration room. This room bustled with people registering, inquiring about new products, and problem solving with each other. 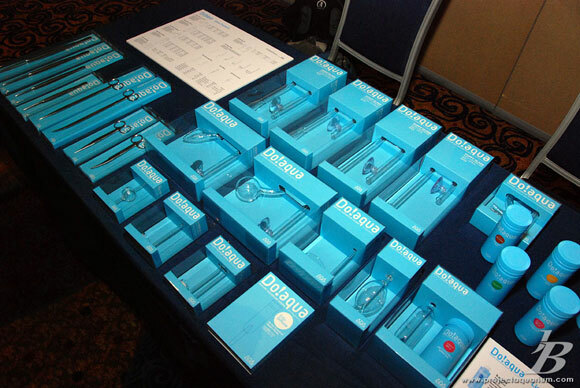 Do!aqua - ADA's Exciting new line of planted aquarium goods!! Phil and company preparing a display tank. Yoshi manning the ADA booth. All of the Presentations/Speakers were met with much excitement. I really encourage all of you that are interested in our wonderful planted aquarium hobby to purchase the DVD’s of the AGA Convention to see the presentations. AGA works so hard to provide us all with a great place to meet; by purchasing a DVD, you will get to see all the presentations, learn from some masters, and support AGA. Here is a list of the presentations from the weekend. 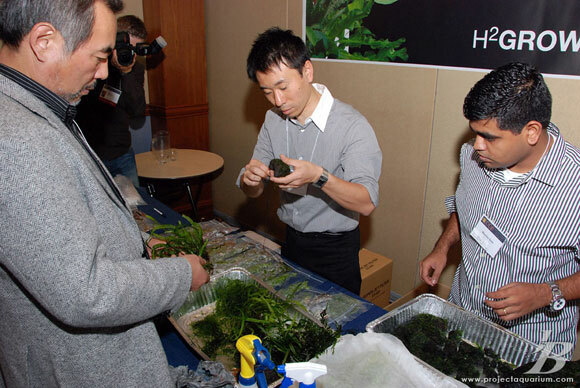 Greg Morin - "Foliar vs. root-zone uptake for ferric and ferrous iron"
Michael Kane - "Tissue Culture for Aquarists"
Benito Tan - "Aquatic Mosses: taxonomy and its application in commercially sold aquarium bryophytes"
Jeff Senske - "Effective Design"
Takashi Amano - "Aquascaping Presentation and Demonstration"
Karen Randall - "Collecting in Thailand"
I was one of two honored with the opportunity to be a contestant in the Iron Aquascaper. 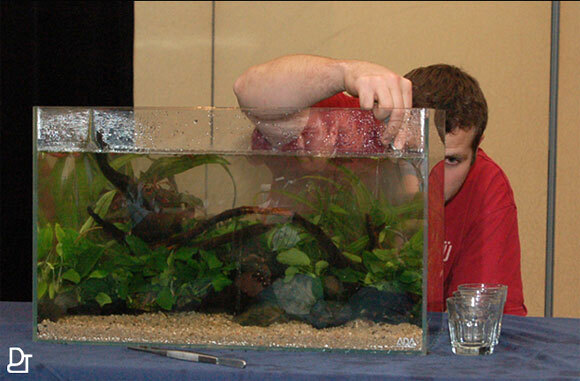 My opponent, John Ciotti, and I both had 1 hour to produce an aquascape for judging. 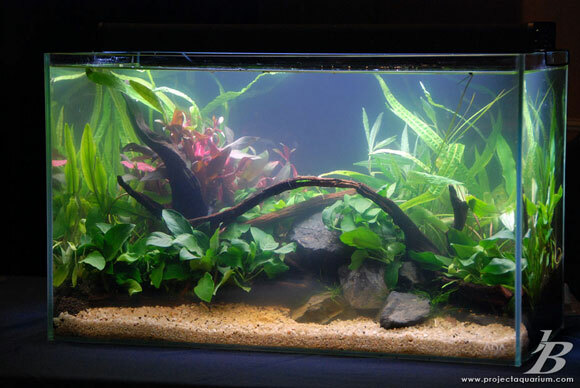 At our workstations we were presented with ADA 60p’s (provided by ADG), similar rocks and wood, identical plants (focusing on anubias), tools, and ADA Aquasoil and sand. The gun went off and I feverishly worked to create an idea with the tools and materials I had. It was a lot of fun for sure. The pressure was great at times, but the encouragement from the onlookers and the truly hilarious commentary from Jeff Senske kept things cool and fun. Only a few times did I really feel the burn of having only 1 hour to create. As the final bell sounded, both John and I were done and fairly satisfied with what we created in the short amount of time. It was now time to sit back and let the judges decide the winner. As I stood up there waiting for the results, I was a little nervous, but excited at the same time, to be involved with such a cool event. 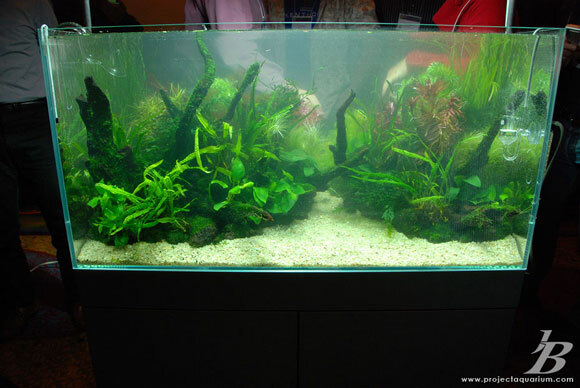 Jeff announced that John Ciotti was the winner of the Iron Aquascape contest. John was a very gracious winner. We shook hands and continued the friendship and respect we started building hours before at the Georgia Aquarium field trip. 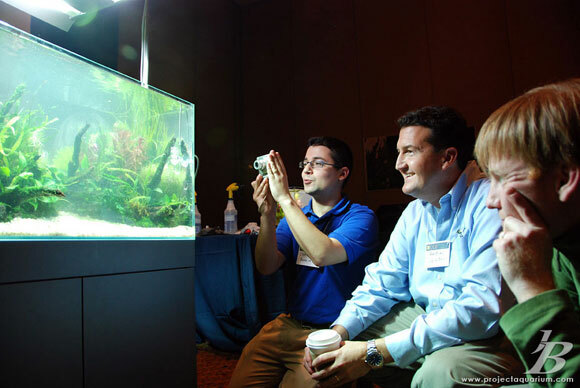 John is a great aquarist and photographer and I learned quite a bit from him through this experience and throughout the entire weekend. It was a great experience and I was honored to be part of it. Great shot by John Dinh!! After the excitement of the event it was time to unwind with a cigar. A couple of us found our way to a patio, enjoyed a cigar, good company, and reflected on the events of the day. What a great day it was! The next day may have been the most anticipated by all of the attendees of the convention. 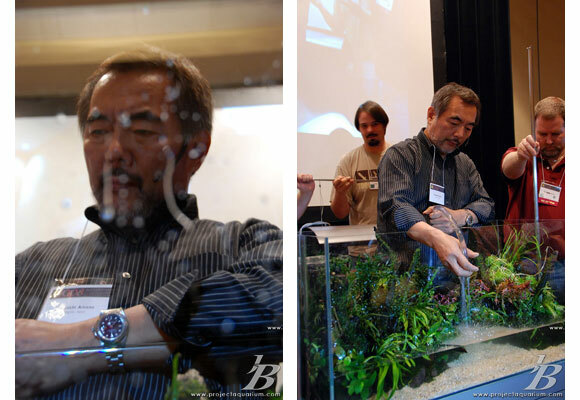 Today we were going to see Amano do a presentation on planted aquariums followed by an actual demonstration. I am writing another article on this that will go more in depth. After the demo and presentation by Mr. Amano most of our minds were blown!! It was time to go to the banquet and enjoy good food. I sat with some new friends from Houston. We all enjoyed our food and our conversation. Shortly after our meal the presentation for the AGA Aquascaping Contest results began. I entered this year, but wasn’t expecting too much considering how high the competition level over the previous years has become in the past years. You can imagine my surprise when I saw my tank up there for 2nd place in the large aquarium category. All the presenters were excited to give me my ribbon, as I was the only winner at the convention and also the only winner from the United States. I made my way up to the front, shook hands with Karen Randel, Takashi Amano, and Erik Olsen. It was a great feeling; one I will never forget! Thank You AGA!! As I made my way down to the auction, I saw tables and tables of things in boxes, things in bags, you name it!! Unfortunately, I did not get to enjoy the auction, it was time to catch my plane and end the weekend. I spent an hour saying my goodbyes and made my way to the airport. I never did find out what the entire ADA setup went for? One of the most fulfilling aspects of the weekend was volunteering to help. I volunteered to photograph the event; however, in volunteering I got a chance to help in many areas. I encourage anyone to offer whatever ability they have to help AGA. It has been almost 2 weeks now since I left my new friends. I am still a little sad that I cannot talk to everyone in person every day. I can’t stress enough the importantance of every single person's contribution at that convention is. I enjoyed every conversation with each person. 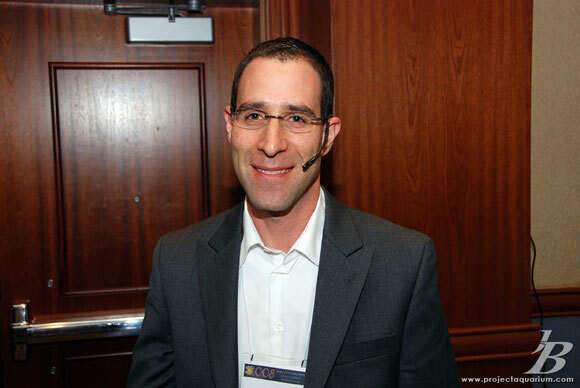 Whether I was sharing my experience, or learning from others, every moment was a pleasure. We truly have the nicest people associated with our hobby. There is a true culture of help and support within our hobby. I was inspired and encouraged by every single person I spoke with. I want to offer my thanks to AGA and their Board Members, the speakers, and planted aquarium enthusiasts from around the world. I want to encourage you all to come and join AGA at the next convention. I wouldn’t miss it for the world. I am looking forward to seeing you all again soon.